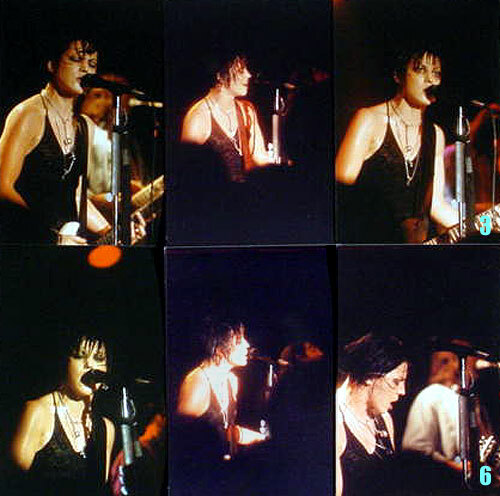 When I mentioned I was going to be interviewing Joan Jett, one of my well-informed fellow workers said, “Well, be sure to ask her about the sect in California that worships her as a god.” So, when J.J. called from Minneapolis—in advance of her Saturday (February 8) show at 86 Street—I took the plunge, hoping to hell this guy wasn’t just pulling my leg. “No, he’s not kiddin’,” explained the raven-haired rocker. “They’re in San Francisco. I can’t remember the name of it, but they’re there, definitely. In fact, somebody just showed me a picture of something spray-painted on a wall in San Francisco, some big graffiti on the street that said, ‘Joan Jett is God’. If Jett’s San Francisco-based followers are into her musical side, as well, they might just do their worshipping while cranking out tunes from her latest album, Notorious, a nifty disc that sports collaborations with the Replacements’ Paul Westerberg and songwriter-to-the-stars Desmond Child (Bon Jovi, Aerosmith). But in comparison to previous platinum-plus albums such as I Love Rock ’n’ Roll and Up Your Alley (with its Grammy-nominated single, “I Hate Myself for Loving You”), the lukewarm sales of Notorious are a little disappointing. “Yeah, I suppose you could say that,” admitted Jett. “But then, you also need record company support. If you don’t have the displays, and you don’t have people saying to the radio stations, ‘We want you to play this record,’ then what can you do? I could get frustrated and freak out, but that doesn’t do any good, so I just put my energies into doin’ great shows and hope that the power of the people can overcome it, because it certainly did with “I Love Rock ’n’ Roll” [the million-selling title song of the aforementioned album]. But the Philly-born, New York-based Jett—who stole the screen from Michael J. Fox in her acting debut, Light of Day—has proven as tough and resilient in real life as her streetwise image would suggest. She’s got no complaints.